My preparation to NUOVA's program, besides the essential logistic tasks, includes research on many levels: on the texts I will sing, on the profiles of the characters I will play, on the intrigues of the operas that will be created, and on the musical styles they were composed in. I also want to learn the repertoire by heart as soon as possible and possess the roles technically, in order to be able to focus on the stage work during the program. I am delighted to participate in the next edition of Opera NUOVA’s emerging artist program. I have heard a lot of positive comments about it, from colleagues that have participated in one of the previous editions. I know it is probably one of the best programs of this type offered in Canada. I am also particularly enthusiastic about this year’s program, since the emphasis will be put on acting and related skills (moving on stage, interacting with other singers, improvising, etc.). It is just what I need at this point of my career: develop specific skills in order to gain confidence, feel more at ease on stage and improve my acting. I am sure Opera NUOVA’s emerging artist program will help me to reach these goals. A native of Quebec City, mezzo-soprano Marie-Andrée Mathieu is appreciated for her vocal agility and remarkable musical expressivity. Named “Jeune espoir lyrique québécois” by the Jeunes Ambassadeurs Lyriques, Marie-Andrée Mathieu was lately invited to sing in Germany, China, Slovakia and Italia. Selected for the prestigious Concours Reine Élisabeth de Belgique by the end of her studies, and more recently for the Concours musical international de Montréal, she was also a semifinalist at the Concours international de chant de Marmande and at the Concours de l’Orchestre symphonique de Montréal. On stage, among other roles, she was Sesto in La clemenza di Tito (Montréal), Nicklausse in Les contes d’Hoffmann (Rimouski), Orphée in Orphée et Eurydice (Québec), “Un plaisir” in Armide (Mainz, Germany). Next fall, she will sing Cherubino in Le nozze di Figaro, on tour with Les Jeunesses musicales du Canada and at the Festival d’opéra de Québec. 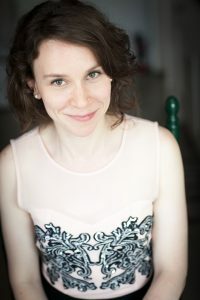 She is regularly invited as a soloist for recitals and concerts, including for Beethoven’s C major mass with the Slovak State Philarmonic Orchestra , for Bach’s Mass in B minor with Bishop’s University orchestra and choir and for Bach’s Saint John’s Passion with the McGill Chamber Orchestra. Among others, she sang for Festival de Lanaudière, Musique de chambre Sainte-Pétronille and Les Concerts Couperin. Ms. Mathieu holds a Master’s degree in classical singing performance from Laval University, where she graduated with an award for excellence. She studied with soprano Patricia Fournier, with whom she still works to this day. A versatile musician, Marie-Andrée Mathieu has also studied piano and guitar. Since her stage debut, Ms. Mathieu has performed in a wide range of styles, including Brazilian music and French song. Among other projects, she is the lead singer in French song ensemble La Virevolte. She is also a member of the chamber choir La Chapelle de Québec.